New or Used Ford is hard work! Here at Blue Springs Ford, we take pride in the sales and service team's ability to show up everyday and give it their absolute best to servicing our customers. While we continually explore new ways to grow our business and serve our customers better, we also have fun together in the midst of all of our hard work doing so. In fact, sometimes the fun is just too much to be kept to ourselves and want to make sure our love and passion for our jobs is shared with all to enjoy! Here is a few videos of Kansas City's favorite New and Used Ford Dealer's behind the scenes and outtakes. Enjoy! Car Dealers Are People Too! 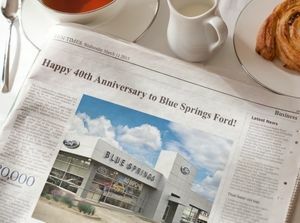 Thank you for visiting Blue Springs Ford's Bloopers! We hope you enjoyed watching these as we did! If you have any funny moments with your Blue Springs Ford vehicle, let us know! Who knows, you could go viral!